Perhaps the most important aspect of caring for your pool is keeping the water’s chemicals properly balanced for safe swimming. Testing your pool’s water twice weekly and adding chemicals as needed is an absolute must. You can test your pool’s water using easy-to-use pool test kits, which are available at any pool store. 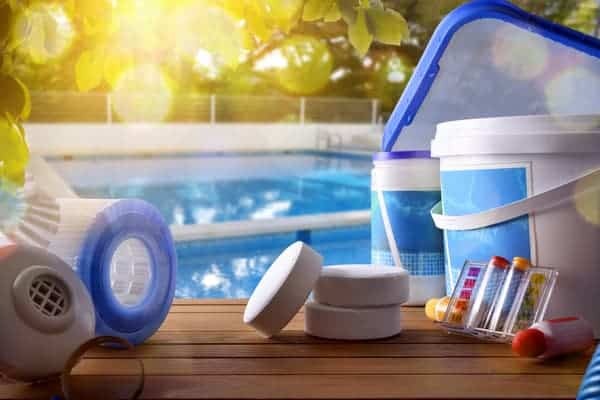 Skipping even a week of pool chemical testing and balancing can sometimes result in your chemicals being thrown way off, which could lead to cloudy water, algae growth, and other serious issues. If you’re having trouble getting your chemical levels in-check, consider bringing a sample of your pool water to a local pool professional for evaluation and guidance. Speaking of pool chemicals, what type of chlorine are you currently using in your pool? If you’re using chlorine pucks or tablets, now is the time to make the switch to straight liquid chlorine. While pucks and tablets may be more convenient because they slowly dissolve and can simply be “chucked” in your pool, they’re not as effective and can even damage your pool’s surface over time. Adding liquid chlorine will help you gain better control over your pool’s chlorine levels and protect your plaster surface. Liquid chlorine does tend to cost a bit more than tablets, but most pool owners will agree that the added cost is worth it. Another important aspect of pool maintenance is regular skimming and vacuuming of your pool. Ideally, you should be skimming your pool at least once a day to remove fallen debris. You should never rely solely on your pool filter to get rid of every little piece of debris. Skimming your pool at least once a day will help keep your water crystal clear while also giving your pool filter a much-needed break. And for debris that has settled to the bottom of the pool, be sure to vacuum at least once a week; otherwise, this debris can throw off your pool’s chemical balance over time. Many pool owners operate under the misconception that their filters and pumps need to be running 24 hours a day, seven days a week. In reality, that’s not necessary or recommended in most cases. You can generally run your pool filter for 6-8 hours per day, depending on the temperature of the water, bathing load, and other factors. Doing so will help to give this equipment a break, which can help to prolong its life. This can also save you a bit on your energy bills without having a notable impact on the cleanliness of your pool. Your pool’s water level is more important than you might think. Ideally, your water level should be about halfway up to the opening of the skimmer. Of course, evaporation (or lots of cannonballs) can lower your pool’s water level, so you may need to add more using a garden hose from time to time. On the other hand, if heavy rains leave your pool’s water levels too high, you will need to remove some water. This can be done using a submersible pump, which you can either purchase outright or rent from most pool supply or home improvement stores. If you have a DE filter, you can use the backwash setting to drain your pool instead. Keeping your pool’s water levels consistent will help to ensure that your filtration system works as efficiently as possible. If you ever find that you don’t have enough time to perform these pool maintenance tasks on your own, you can always call a professional for assistance. At Summerhill Pools, we’re proud to offer pool maintenance as one of our many services. We can also assist with your swimming pool design, pool remodel, pool repair, and more! Contact us today to find out more about what we can do for you. We’ve been serving the Dallas area for 30 years and counting.